It is another election year in Nigeria and uncertainty resonates across the entire political climate. There are seventy-three candidates, according to Independent National Electoral Commission (INEC), vying for a chance to lead the country for the next four years. However, we believe that the two main parties—the ruling All Progressive Congress (APC) and the main opposition party, People’s Democratic Party (PDP)—will be the key contenders, with current President, Muhammadu Buhari and former Vice President, Atiku Abubakar, their respective flagbearers. In the past, ethnicity and religion played a significant role in the presidential elections, but this is less of a factor in the upcoming polls as both aspirants belong to the same ethnic group and religion—Fulani and Muslim. Also, given the internationally lauded precedent set in the 2015 general elections, we anticipate a non-violent contest in the 2019 general elections. While political uncertainty will naturally spook investors, recent happenings in the political landscape have further heightened investors’ apathy towards investing in Nigeria. The most noteworthy of these events was the plethora of floor-crossing, especially between the two leading parties, in the last few months. This culminated in the defection of the Senate President, Bukola Saraki and the Speaker of the House, Yakubu Dogara from the APC to the PDP. Recently, we have seen this politically motivated act cause a rift between the executive and legislative arms of government, with direct implications on the passage of opposition-sponsored bills in the National Assembly. 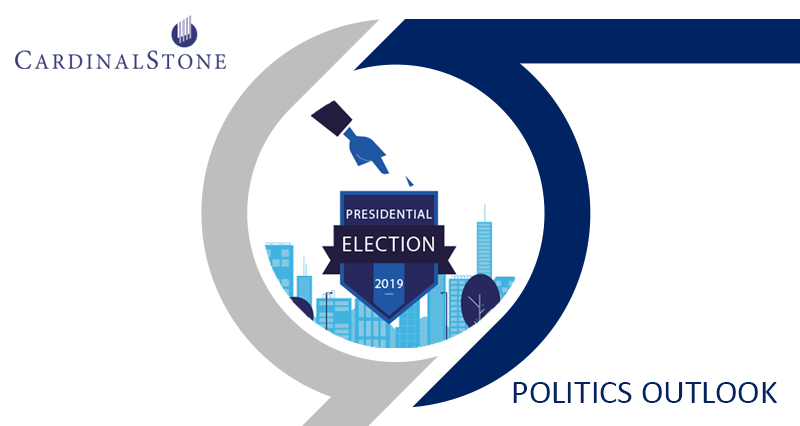 Despite the huge number of presidential candidates, our focus is on the contenders from the two major political parties (APC and PDP), the probability that either will win and the policy reforms that will follow. While we acknowledge that from a political standpoint there are no clear differences between the two parties, we believe that the incumbent, President Muhammadu Buhari, is likely to offer more stability in the short term—in the absence of aggressive policy reforms. On the flip side, the major opposition candidate, Atiku Abubakar, a former vice president (1999 – 2007), is more tilted towards market-driven reforms, which should drive economic activities in the country. Prominent flagbearers from the other parties include Oby Ezekwesili (Action Congress Party of Nigeria – ACPN), Fela Durotoye (Alliance for New Nigeria – ANN), Gbenga Olawepo-Hashim (People’s Trust – PT), Kingsley Moghalu (Young Progressive Party – YPP) and Omoyele Sowore (African Action Congress – AAC). These candidates have managed to drum up support across various sub-cultures in the polity. The message of economic change and system reform from Omoyele Sowere, Kingsley Moghalu and Fela Durotoye have struck a chord with some middle-class and younger voters in the urban areas. Oby Ezekwesili’s message of accountability has resonated with some voters both nationally and internationally, including Nigerians in diaspora. However, the aforementioned candidates are unlikely to pose a strong challenge for the presidency as we do not believe that they currently possess the financial backing, platform and required geographical reach to contest and win an election in a heterogeneous country like Nigeria. Instead, our assessment is that the upcoming presidential polls will be a two-horse race between the ruling APC and the opposition PDP, who are both more formidable in platform and geographical spread. A lot of factors come into play going into the 2019 general elections when assessing how voters are likely to cast their votes. These factors range from the financial backing of the candidates, personal background (education, religion, ethnic heritage), party loyalty among various states and others. Below, we will assess the possible dynamics of the presidential election across the different geopolitical zones. The North West of the country handed President Buhari the victory in the 2015 elections, with a total of 7.2 million votes (46% of his total vote). This region is poised to remain a stronghold for the incumbent in the upcoming elections, given the President’s unwavering grassroot support. In fact, President Buhari has won all 7 north-western states in the last two presidential elections (2011 and 2015) by very comfortable margins. However, we envisage the margin of victory in the region to reduce on vote splitting across religious and ethnic lines—both candidates are Muslim and Fulani. Moreover, we expect the high profile defections witnessed in 2018 from the ruling APC to the major opposing party (PDP) to have an, albeit moderate, impact on the APC’s expected margin of victory in the region. This considers recent events in states such as Sokoto, Kano and Zamfara, in particular. We expect the defection of the incumbent governor of Sokoto State, Aminu Tambuwal to the PDP to swing reasonable votes to the party’s flagbearer, given the Governor’s influence and popularity in a state which accounted for c.10% of the votes in the North West in the 2015 elections. 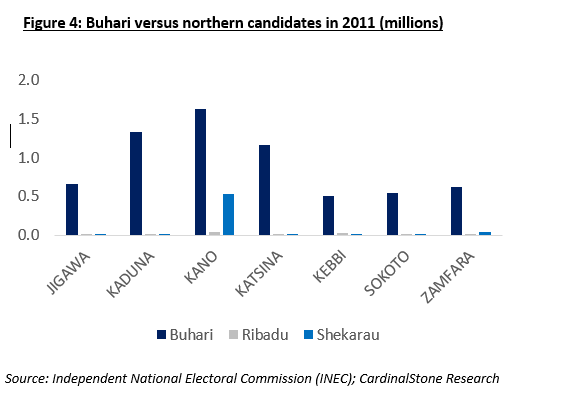 Similarly, we posit that Kano State (c.25% of 2015 votes in North West), the most populous northern state, is unlikely to be as much of a landslide for the APC as was the case in the 2015 elections. We expect a smaller margin of victory for the APC, given that Atiku is also a northerner and more pertinently, the defection of the former Kano State Governor, Rabiu Kwankwaso—an influential figure in the state, with a loyal following. Finally, the division in the ruling APC in Zamfara State, (culminating in INEC’s decision to ban the party from fielding gubernatorial candidates in the upcoming elections) may provide an opportunity for the opposition candidate to gain ground in the North West. We highlight, however, that recent reports suggest some 10,000 Kwankwaso supporters and unspecified number of Tambuwal loyalists have defected to the APC. These alleged developments will inevitably work in favour of the President if they crystallise and cascade. Buhari’s grassroot support in the North West has proven resilient over three election cycles, and we expect this to remain the same in the upcoming elections. Stronghold states like Katsina and Kano and a majority vote in three other regions should be enough to see the incumbent through to victory in the polls. Votes in the North (and largely around the country) tend to be influenced by sentiment—ethnic and religious sentiment in particular. We expect that former Vice President, Atiku Abubakar, who hails from the North East, will get considerable support from the region come February 2019. We envisage that he will be competitive in his home town of Adamawa (c.16% of NE votes), which was won by APC in the last election with 59% of the votes. Although the incumbent governor of the state is camped with the ruling APC, we do not rule out a fierce competition. President Muhammadu Buhari lost the state in 2011 to former President Goodluck Jonathan and while we acknowledge the role the power of incumbency played in 2011, there remains the possibility of yet another upset for President Buhari in the state. To the east of Adamawa, in Gombe State, another battle lies ahead for the ruling APC as the incumbent state governor, Ibrahim Dankwambo, is likely to wield enough influence to lure some votes away from the APC. However, we highlight that Buhari captured over 79% of the votes in this state during the last election (2011 elections: c.63% of total votes), and we believe that his stronger grassroot support and his brand of incorruptibility is likely to see him through. In contrast, we expect Taraba State—which saw votes split 54% to 45% in favour of APC in 2015—to reverse in favour of PDP due to the decamping of Aisha Alhassan—an ally of Atiku Abubakar, popularly known as “Mama Taraba”—from the APC to the United Democratic Party, UDP. The other states in the region (Bauchi, Borno, and Yobe) are expected to vote convincingly in favour of the incumbent, akin to voting patterns recorded in 2011 and 2015 elections. We point out that the aforementioned regions voted overwhelmingly for the incumbent over other popular northerners (Ribadu and Shekarau), despite significantly less state resources at his disposal back then. President Buhari’s dominance over fellow northern contenders is visible from the chart below. In 2015, votes from other northern candidates were negligible and as such would fail to register in a 2015 chart. All-in, we envisage that Atiku will have to wield a much fiercer challenge if he is to prise the North East region—which was a stomping ground for Buhari in the last two elections (2015: c.67.4% of votes, 2011: c.78% of votes)—from the hands of the ruling party. 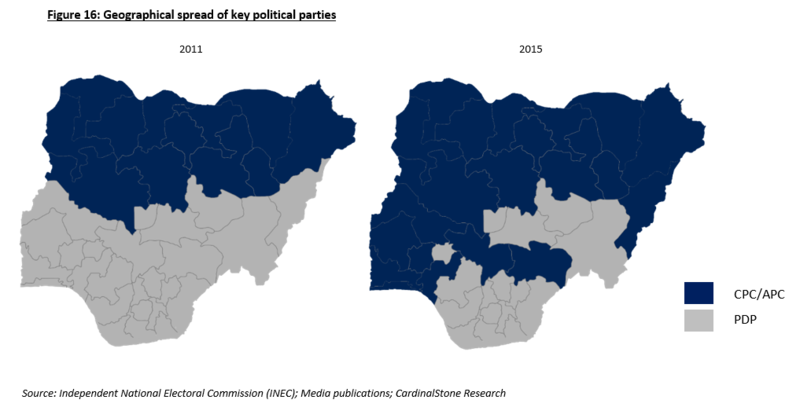 Few surprises are poised to pan out, notably with respect to the Middlebelt (North Central) states, which swung from the PDP in 2011 to the APC in 2015. Arguably the toughest region to posit, the North Central has proven to be a swing region in the last two presidential election cycles. Benue State, Kwara State, Nasarawa State and the Federal Capital Territory (FCT) in particular have the potential to swing in either direction. We believe that this is to some extent related to the host communities’ dissatisfaction with the government’s handling of the Fulani herders-farmers clashes in the area. In Benue State, Governor Samuel Ortom, dissatisfied with the support from the federal government regarding the destructive incidences of herdsmen-farmer clashes, defected to the opposing PDP. The spread of political power across the state (using the legislative as a proxy) swung to the PDP, as several members of the APC in the house decamped to the PDP in 2018. In Kwara State, the last presidential elections swung from the ruling PDP to APC by a comfortable margin (APC: 68% of votes, PDP: 30% of votes). However, given that the then governor, Bukola Saraki—now Senate President—who played an important role in securing the victory, has switched allegiances to the PDP, we expect a close battle in the state. Nasarawa is another state that swung in the 2015 elections, albeit by a close margin. We envisage another tight race in this state, especially as herdsmen clashes may have soured sentiment towards the current administration. Nonetheless, the state is currently governed by the APC, and the influence of the ruling party cannot be underestimated. The APC is expected to retain most of their territory in the South West given their significantly stronger base than the PDP currently. Following the 2015 elections, the APC controlled 4 of the 6 states in the South West. However, recent elections have put Ekiti and Ondo states—formerly under the control of the PDP and Labour party respectively—in the hands of the APC. Using these last two gubernatorial elections in the region as a barometer for the upcoming polls, we envisage a close contest in a few key states (Lagos, Ekiti and Osun). Irrespectively, we believe that the ruling party possesses the wherewithal to see the race through, as observed in the recently concluded gubernatorial elections in Osun and Ekiti states. Another positive that could bolster APC’s chances in the South West is that the party’s vice presidential candidate, Yemi Osinbajo, hails from the region. South East and South South states voted predominantly for the PDP during the last two presidential elections and it is widely expected to remain the same come February 2019. The one state occupied by the APC—Imo State— failed to hand President Buhari as much as 20% of the state’s vote in 2015, as Buhari lost convincingly. Anambra state, which is governed by a smaller party, APGA, may divide the votes of the PDP to close the gap between the Buhari and Atiku. However, we do not foresee strong competition from the APC in this region. We point out that the turnout in the South East nearly halved between the 2011 and 2015 elections—from 5.1 million votes in 2011 to 2.8 million votes in 2015. Likewise, the percentage of actual voters to registered voters shrunk from 66% to 43% over the period. Indeed, we note that if the South East region had the same number of voters in 2015 as it did in 2011 (split between APC and PDP in the same proportion as in 2015), the 2015 presidential election would have been decided by a difference of about 700 thousand votes, as opposed to the 2.5 million votes recorded in favour of Buhari. Higher voter turnout in the South East will almost inevitably favour the PDP. While we believe that the chances of an improved turnout are, on the one hand, boosted by having a south-easterner, Peter Obi, as the vice presidential candidate of PDP, we note, on the other hand, the agitation by the Indigenous People of Biafra (IPOB), who are pushing for referendum for the secession of the region to form an independent state of Biafra. This has led to calls for the majority of the electorate to boycott the elections. The vice presidential candidacy offered to Peter Obi represents the highest political office available to a south-easterner since the start of the Fourth Republic in May 1999. 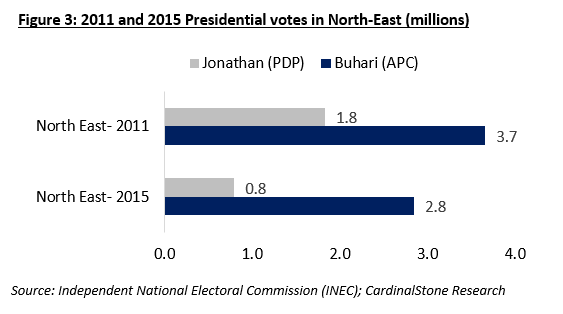 Furthermore, there is a likelihood that south-eastern votes may be somewhat more split from the PDP, even in the event of higher voter turnout. The emergence of reputable south-eastern candidates such as Oby Ezekwesili and Kingsley Moghalu could lure otherwise assured votes from the PDP. More so, APGA, the political party governing Anambra state (and the former party of vice presidential candidate, Peter Obi, when he served as governor in the state between 2007 – 2014), have fielded a presidential candidate, Major-General John Gbor. While we envisage these developments complicating PDP’s path to dominance in the region, we still foresee a victory for the party in line with historical trends (SE 2015: c.92% of votes to PDP, SE 2011: c.98% of votes). The PDP has recorded landslide in the South-South, winning over 90% of the votes, during the last two elections. However, while we envisage a clear victory for the PDP in this region, we think that a few states have the potential to break the mould in favour of the APC, due to the cross-carpeting of several influencers in the region, as well as possible voter apathy along ethnic lines. Votes in the region may be lower compared to previous years due to protest votes and increased apathy as both candidates are Muslim/Fulani and neither have running mates from the region. Voter apathy in the region is likely to have a stronger impact on the PDP, given that the region has been one of their key strongholds in the country. By states, we expect PDP to win by a comfortable margin, however, we envision stronger competition from the APC, compared to previous elections (Buhari 2011 votes SS: 1%, Buhari 2015 votes SS :4%). Edo State, which was a landslide for the PDP in 2011, proved to be a hotly contested region in 2015 with a 41% to 57% split between the APC and PDP. The state, bordered by two south-western states, swung the way of PDP in the 2015 presidential elections. However, the governorship race was won by Godwin Obaseki of the APC. Hence, with the state currently being controlled by the APC, as well as the fact that the national chairman of the APC, Adams Oshiomole, hails from the state, we believe that there is the potential for a swing in favour of President Muhammadu Buhari. Similarly, in Akwa Ibom State, the defection of political heavyweight, Godswill Akpabio, to the APC poses a threat to PDP’s dominance in the state. The APC was only able to get c.6% of the votes in the state in 2015, and Buhari got a meagre 0.4% in 2011. Furthermore, Rivers State, which has seen PDP dominance in the last two elections may finally face opposition in the coming elections. The APC may be able to gain ground in the state as all three senators from the state are currently camped with the ruling party, while the current Governor, Nyesom Wike, has been reluctant to put his weight behind his party’s flagbearer, Atiku. These factors may just create the vacuum in the state which the APC will be poised to exploit. Of course, the presence of the former governor and current minister of transportation, Rotimi Amaechi, will further boost the APC’s chances in the region. While we do not expect PDP to lose the state, the party’s margin of victory could shrink come February 2019. Below we analyse possible voting scenarios and the likely outcomes. Scenario 1 – Voting distribution is held constant as in 2015, but North Central swings to PDP in 2019. Voting pattern across all other regions are unchanged from 2015 levels. Comment: In this scenario, President Buhari emerges victorious despite the North Central region swinging in favour of Atiku. Scenario 2 – Adjust margin of victory from 2015 elections to account for ethnic, religious and other differences between Goodluck Jonathan and Atiku Abubakar. Both parties are victorious in the same regions as was the case in 2015. We adjust the margin of victory to reflect the potential impact of the change in candidates (based on ethnicity, popularity or political influence) For instance, Atiku’s performance is assumed to surpass that of Jonathan in the North-East, but be weaker in the South-South. Comment: In this scenario, Atiku emerges victorious but the margin of victory is marginal. This analysis displays the potential for an Atiku victory, even in a scenario where APC is victorious in all the same regions as in 2015. This is possible if the PDP is able to reduce the margin of victory for the APC in the North West and North East. For example, our scenario assumes the margin of victory in the North West declines to 75% APC vs 25% PDP (2015: APC 84%, PDP 16%), while North East shrinks to 70% APC vs 30% PDP (2015: APC 78%, PDP 22%). We also assumed Atiku Abubakar captures 85% of the votes in the South East and South South (vs 92% captured by Goodluck Jonathan in 2015). We note that PDP’s South East votes can be affected by a possible boycott of IPOB supporters from the elections, the presence of other south-eastern candidates such as Oby and Moghalu, and the power of incumbency to sway votes. Scenario 3 – Atiku’s votes is split in the South due to voter support for fringe players and protest votes based on ethnicity and religion, but North-Central swings to PDP and APC loses some ground in the North East. Turn out in the South East is reduced for the PDP presidential candidate, given that three prominent figures in election—Peter Obi, Vice Presidential candidate for PDP, Oby Ezekwesili (ACPN) and Kingsley Moghalu (YPP)—all hail from the South East. Comment: In this scenario, the swing in North Central to the PDP by a wider margin and an increase in the percentage of PDP votes in the North East is enough to counter the dominance of Buhari in the North West. This is also despite a lower percentage of votes won by the PDP in the South East and South South (85% vs 92% in 2015). This scenario highlights that PDP stands a good chance of victory in 2019 if they are able to swing North-Central votes and reduce President Buhari’s margin of victory in the North, while retaining control of the South East and South South. Scenario 4 – APC consolidate votes in the South West but lose some ground in the North East and North West. We tilt South West votes slightly in favour of the incumbent, as the APC now control all states in the territory. This scenario assumes a vote split of 65% to 35% in favour of the incumbent (2015: 57% APC vs 43% PDP). The APC’s margin of victory in the North-East is reduced from 78% in 2015 to 65% in 2019. Similarly, the party is assumed to lose some ground in the North-West from 84% in 2015 to 75% victory in 2019. Comments: In this scenario, despite the APC losing some ground in the northern part of the country, they are able to record a marginal victory by consolidating votes in the South West. However, if the indications from the recent Osun and Ekiti Gubernatorial elections are anything to go by, we envisage a much fiercer challenge from the PDP in the region come February 2019. Overall, we anticipate a tightly contested election. Success in the 2019 presidential elections hinges on the ability of the two main parties involved to consolidate votes in their respective strongholds. We have seen that a victory is likely for the PDP if they are able to gain ground in the North. This victory is possible even if APC retains victory in the same regions as in 2015. Conversely, the APC will need to consolidate its votes in the South West, while retaining its firm grip in the North in order to secure a second term for President Muhammadu Buhari. The research analyst(s) denoted by an “*” on the cover of this report certifies (or, where multiple research analysts are primarily responsible for this report, the research analysts denoted by an “*” on the cover or within the document individually certifies, with respect to each security or issuer that the research analyst(s) cover in this research) that: (1) all of the views expressed in this report accurately articulate the research analyst(s) independent views/opinions, based on public information regarding the companies, securities, industries or markets discussed in this report. (2) The research analyst(s) compensation or remuneration is in no way connected (either directly or indirectly) to the specific recommendations, estimates or opinions expressed in this report. Analysts’ Compensation: The research analyst(s) responsible for the preparation of this report receive compensation based upon various factors, including the quality and accuracy of research, client feedback, competitive factors, and overall firm revenues, which include revenues from, among other business units, Investment Banking and Asset Management. Conflict of Interest: It is the policy of CardinalStone Partners Limited and its subsidiaries and affiliates (individually and collectively referred to as “CardinalStone”) that research analysts may not be involved in activities that suggest that they are representing the interests of Cardinal Stone in a way likely to appear to be inconsistent with providing independent investment research. In addition, research analysts’ reporting lines are structured to avoid any conflict of interests. For example, research analysts are not subject to the supervision or control of anyone in CardinalStone’s Investment Banking or Sales and Trading departments. However, such sales and trading departments may trade, as principal, based on the research analyst’s published research. Therefore, the proprietary interests of those Sales and Trading departments may conflict with your interests.